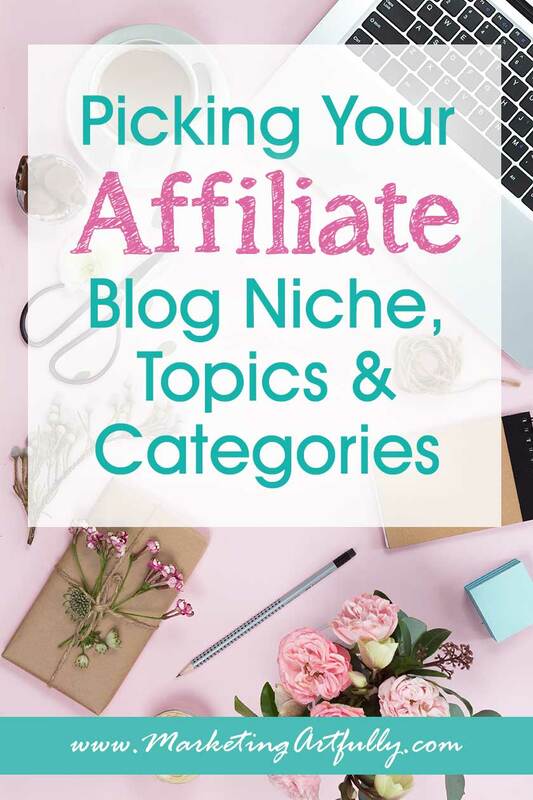 If you are setting a blog or website to do affiliate marketing the very first step is figuring out an overarching topic for your blog and then how you work down to each of the internal categories that you are going to use on your site and then the kinds of posts that you are going to write. 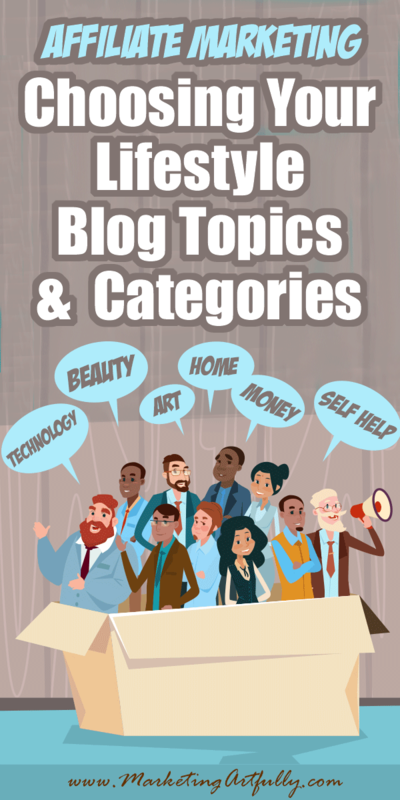 What Topic Is Your Blog? So let’s start with your blog’s “topic”. Now, we all want to be different and we will make sure to get to that later, but to be successful we need our site to fit into one-ish overarching topic. This is because humans like to understand things easily and if you have a blog with too many competing topics it could be confusing and hard to rank in search engines. For example Marketing Artfully is a Business Blog. I mostly represent tools and products that will help business owners with the affiliate products I choose. This doesn’t mean that you have to call your site this or use it in your tagline, but since sites like Amazon and Pinterest tend to lump sites into these kinds of overarching topics it does seem to make sense. Now the big question… can you have 2 or 3 topics? I DO think that two overlapping topics would be workable! For example, you could do a money blog that focuses on family or a self help blog that is also about style! I can hear some of you now! But I want to have three or four different topics. Well, first off, that is hard to juggle time wise AND it makes for a more confusing site. So if you are just getting started, pick at most two and the move on from there! Your other option would be to make different sites for the different topics. Not out of the question but could be time consuming if you aren’t techy. Okay now that we have an overarching topic or two, let’s get down to the categories that you are going to use for your site. 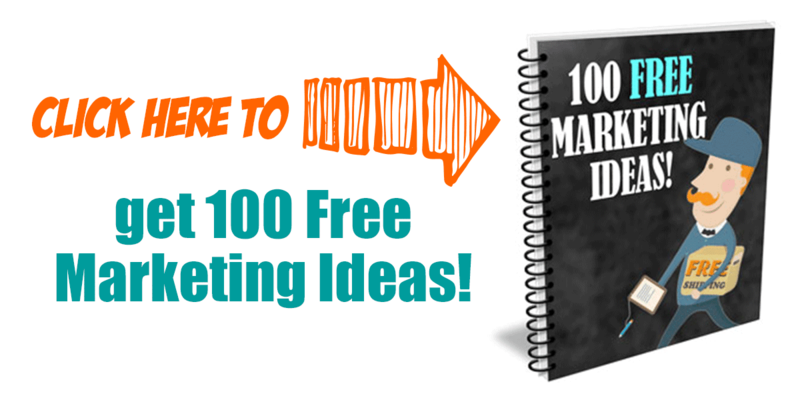 There are main kinds of posts you are going to have, OR your audience types OR your niches. As you can see, these are still WAY high levels of interest. For example, there are a million food bloggers out there talking about cooking! You could break this down further for your categories depending on what you are cooking. Next could be WHO is reading your blog. For example I talk about Business Marketing as my Topic, and then niche it down to Entrepreneurs, Real Estate Agents, Writers or Etsy Sellers. So for me, the main ways that I categorize my site (and my YouTube playlists) is first by who I made the post or video for. This could work for any type of people. For example, my friend Kir is a triathlete who was very focused on working with people doing Ironman races, until she got pregnant. Now she is going to branch off into athletes during pregnancy and then maybe even into raising your baby vegan for vegan mothers. This one starts with who you are writing for! The other thing that you could focus on is niches. For example, you could talk about Frugal living but have niches for Tiny Houses, Couponing and Deals. In this scenario your topic is the main thing and then you have two or three strong niches that you write about in your content. The more topics you get, the more niches you have, the more confusion for your reader with what your site is about! Now let’s look at how your chosen topic effects what types of affiliate products you can sell. For example, say I had a site (artsyfartsylife.com) whose topics were Self Help and Style & Fashion for Women Over 50. I could represent Amazon products in the Beauty, Clothing & Accessories, Jewelry & Watches AND Self Help Courses and Worksheets from Clickbank. Now, those are some of the easiest programs to join, but there are also amazing products in ShareASale (my favorite affiliate site!) and other higher end affiliate aggregators. Here is Amazon’s full list of categories, as an affilate it is nice to know that there are Amazon products that you can represent, even as you are just getting started! Here are some more lifestyle blog categories…taken directly from the categories in Pinterest! 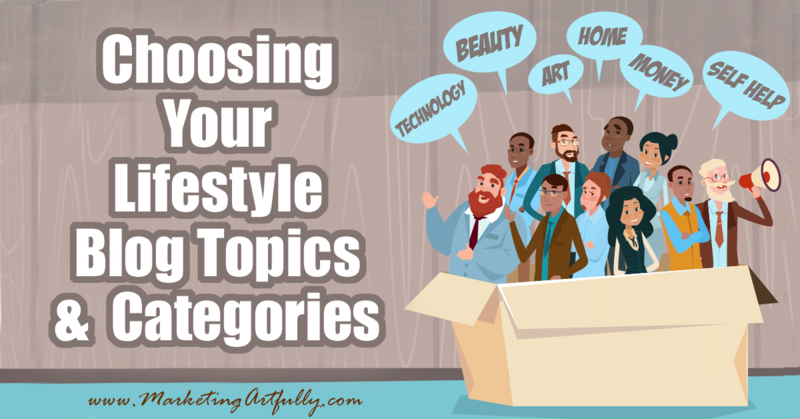 Well, I hope that this has at least helped to get you thinking about how to pick an overall topic and then categories to use in your blog or website. For some of you this will be easy! You are a travel blogger and so you are an affiliate for suitcases and travel sites. Easy peasy. For some of you this will be harder. My friend who is in the metaphysical space can start with self help and then astronomy, but that is not exactly right and doesn’t exactly cover what she wants to talk about. She is going to have to get a wee bit more creative with her categories, but in the end, I promise it will all work out!